A big, beautiful, moody tease of a film, A Ghost Story is indie at heart and magical on top. C (Affleck) and M (Mara) live together in a small suburban bungalow in Texas. After C dies in a car crash outside their home, he comes back to the bungalow as a ghost, a silent witness to M’s grieving process. When she moves out, the ghost finds itself anchored to the home, its disintegrating memories and experiences with the new tenants slowly giving way to something more cosmic. This is an exceptionally good piece of woozy Americana. Lowery has worked with Affleck and Mara before, in 2013’s Ain’t Them Bodies Saints. That was a lovely, atmospheric film, with perhaps too much story. Lowery gets the mood-narrative split spot on here. The split throws up questions relating to what the film is really ‘about’, but, hey, that’s movie magic. Some will say: if you take away the story you are left with just another exercise in Malick-lite film making. But the bizarre idea at the centre of A Ghost Story is so appealing that the film succeeds visually, emotionally, and conceptually. In 2013, the actors played troubled lovers and the connection glowed off the screen. Here, the lovers are further down – and further apart on – Trouble Road. Then again, Affleck has come to have, as the Dutch say, ‘a face that would look better with a fist in it’. So the bold conceit of this film – to have the ghost represented as a figure covered by a long white sheet – seems remarkably felicitous; and the audience can get on with empathising with the despairingly gamine looks of Rooney Mara. Which is easy to do. Because, just as you’re getting used to the surprise of a sheeted ghost in every frame, Mara eats her way through an entire chocolate pie in real time and in a single take, while sitting on the kitchen floor, crying. Four minutes! That is movie magic of a different kind. A Ghost Story starts with a conceit and the conceits keep coming. This is a film that appears to explore the nature of grief. We definitely ‘see’ grief, on the kitchen floor and elsewhere. But A Ghost Story is essayistic in nature: it also asks the question: what is the nature of a ghost? And then explores options. Watching it, you find yourself working through the film’s answers to questions that get more and more outlandish: what is a ghost? where would a ghost live? what would a ghost remember? Isn’t it exceptional for a film to be a pitch-perfect safe space in which such questions can be explored? For that reason alone, A Ghost Story reminds me of the 1950s sci-fi classic The Incredible Shrinking Man, another film that is housebound and full of iconic images that answer to an existential dread. Perhaps A Ghost Story is The Incredible Shrinking Man reconfigured for Generation Xers? The Incredible Shrinking Man meets Enter the Void? 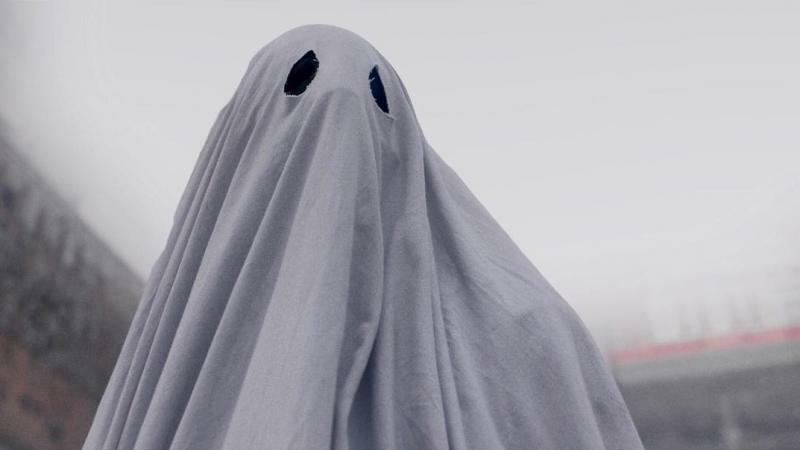 Speaking of existential dread, the film uses the contrast between the physicality of the ghost (during filming, hours were spent making the sheet look more substantial than a sheet would look) and its affectless presence, to great effect. But isn’t that a contrast that characterises most of us non-ghosts too? Questions about the nature of ghosts are necessarily domesticated in A Ghost Story. Although he engages in some angry poltergeist activity, C’s ghost is strongly linked, by love, memory and hope (of a return of the loved one) to a specific place. But specific memories (of that place and what went on there) disintegrate. C’s ghost, like the ghost next door with whom he communicates on several occasions, becomes a repository of abstract hope and memory, which allows him to journey away from the home and into endless time loops that still anchor in C’s life with M.
It’s a lovely idea and one that doesn’t have to emanate from a spiritual belief system: C’s ghost witnesses Will Oldham’s partygoing motormouth suggest the infinite frame for life in the cosmos and what comes before and after it. Is this the inspiration he needs to move beyond the bungalow when the time comes? These aren’t serious questions. I’m pretty sure that A Ghost Story has no intention of being profound, despite the subject matter. It inhabits a threshold where playful and moody meet, while representing the essential element of grief in all our lives. That works for me. A Ghost Story comes to UK cinemas on 11 August 2017.